To many fans of the original city building simulation series, the idea of an online multiplayer game that required even solo players to be connected to the internet at all times seemed like a recipe for disaster. Maxis' latest creation is easily the most compelling SimCity I've played since the 1989 original. Update: Final verdict reached. The weekend before the game's March 5 launch, I had a chance to experience SimCity the way everyone is supposed to be experiencing it right now. The handful of press participating barely put a dent on the special servers EA set up for the event. The game played (for the most part) flawlessly, giving early reviewers an exquisite taste of the collaborative multiplayer that defines the release. I saw what the developers no doubt wanted every player to see post-launch — a new SimCity capable of bringing together people from across the planet to strive towards a common goal. It was glorious. I collected that early experience in an article titled "SimCity Won (and Broke) My Heart in Just Three Days." I had no idea how apropos that headline would become. That first, teasing taste was followed by a nightmare for everyone involved. There were problems downloading the game. Problems connecting to servers. Problems getting together with friends to play during the brief moments when everything seemed to be working perfectly. While EA and Maxis work aggressively on a solution to these issues, player frustration and outrage continues to build. I am not filled with outrage; only disappointment, fueled by the knowledge that somewhere beyond these technical issues there's an outstanding game waiting to be played. The original SimCity is one of the greatest computer games of all time. When now-legendary game designer Will Wright realized that using the map editor he'd created for the game Raid on Bungling Bay was more entertaining than the game itself, he gave that editor to the world, creating an entirely new genre in the process. The creative freedom SimCity allowed was intoxicating. I couldn't tell you how long I played when I first launched the game — the days ran together. I would fall asleep in my computer chair, wake up and continue playing. Over the years, freedom and I have had a falling out. Giving me a sandbox to play in with little supervision is a surefire way to ensure I wander away from the sandbox, possibly into busy traffic. So much of my time is not my own these days that I need a more directed experience. I require more than my own devices. This brave new multiplayer SimCity grants me the focus I need to once again lose myself in the minutiae of running a virtual town. The success of my creation is intricately tied to the prosperity of other players'. They depend on me to foster a community of wealthy citizens that will flock to their shops to spend their simoleons. I depend on them to provide sewage treatment and medical services so that the wealthy citizens drawn to my tourist mecca don't die of cholera. The SimCity series has always been a balancing act, with players struggling to maintain the right ratio of residential to industrial to commercial, all the while ensuring that enough funds are invested in services to make sure the whole thing doesn't go up in flames. It's just now there are multiple performers in every region, taking turns walking the tightrope while the others hold the safety net (or drop it, as the case may be). 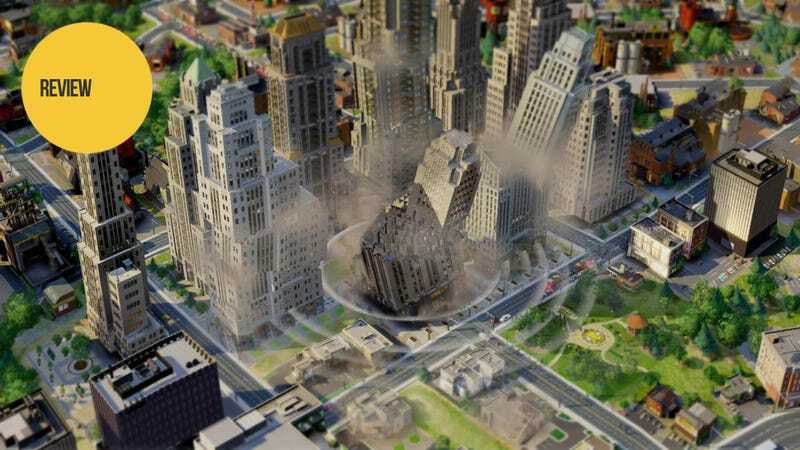 Faith Check: Will SimCity&apos;s Servers Hold Up Next Week? The multiplayer aspect also allows for excellent opportunities to show off your city-planning skills. The creative gamer thrives in the new SimCity, thanks in no small part to the addition of curved and free-form road placement and the ability of residential, commercial and industrial zones to conform to these wild lines. These color-coded areas are painted more than placed, fresh buildings sprouting like architectural flowers that blow in the breeze of every little change the player makes. The GlassBox engine is a remarkable machine, transforming a technical process into something organic and beautiful. It's a joy to watch its work unfold, both from the sky above and at street level. Yes, it's the same video from an earlier article. I couldn't log in long enough to record a fresh one. Players more interested in straight lines and statistics will find plenty to love in SimCity as well. The game is filled with color-coded maps that communicate a wealth of complex information in the most efficient way possible. The interface, aside from the odd obtuse bits, is amazingly intuitive without feeling dumbed-down. Micro-management is an option, but not a necessity. It's one of the game's greatest strengths — catering to multiplayer play styles while remaining completely accessible (I'm talking mechanics, not connection) to all. Of course there are downsides. I wish the individual city plots were larger or expandable, giving my city room to stretch out, perhaps link up with other players' creations. I wish I understood how trade depots work, one of a few obtuse mechanics in an otherwise intuitive game. And I wish I could play consistently. That would be nice. Team Kotaku had big plans for the SimCity launch. We set up a private region so we could further explore the symbiotic relationship between cities. I staked out my claim, a circular piece of land I decided to dedicate to tourism and travel. Stephen Totilo grabbed a plot, his city feeding mine with waste and sewage disposal. Between the two of us we managed to unlock two Great Works — the Arcology and the International Airport — massive undertakings built in special spots on the regional map, requiring cities to work together to harvest the resources necessary for their completion. None of the others made it into the game. Chris Person was able to claim two plots, but both bugged out before he could lay a single road. He can't access them, and we can't delete them. Jason Schreier hasn't been able to connect. Neither has Kirk Hamilton, who received my invitation to join the region yesterday — two days after I sent it. Our grand plan will never be realized. I understand the frustration and anger that players are feeling. Over the past three days I've slept maybe seven hours total, waking from shorts naps taken while waiting for server queues, maintenance downtime, server disconnects and the like. Each of those seven hours was spent in my computer chair, fearing I might miss an opportunity if I wandered off to the bedroom. I feel like I did when I played the original SimCity, only now I'm much older and a lot less happy. SimCity's launch is more than just a disaster — it's a tragedy, because somewhere beyond the rage, pain and technical issues there's an amazing game that I'm dying to play. We'll revisit that Not Yet once EA gets the servers to a point where not playing is no longer mandatory. On March 5 of this year, the latest iteration of SimCity made its grand debut, stepping out onto the PC gaming stage in grand fashion — and then fell flat on its face in front of the entire world. Weeks of connectivity issues, cities founded and lost, games started with groups of friends with joyful intent left involuntarily abandoned — it was a bad scene. And once the connection problems began to clear up, savvy players began uncovering uncomfortable truths about Maxis' ambitious city simulator. The advanced artificial intelligence wasn't quite so advanced. Traffic patterns were broken. They discovered the game's least appealing feature — its always-online requirement — wasn't the necessity we'd been told it was. The entire situation was an embarrassment, and not just for EA and Maxis. Attentive readers will note that I did not participate much in our SimCity Disaster Watch stories. I felt awkward even speaking about the game. Yet I did play. With each major update — we're on nine at this point — I hopped back on, testing out changes and tweaks, fiddling with fresh content, hoping my remaining concerns over the game would be addressed, its lingering problems mopped up. Every major game update has brought fresh problems. Traffic patterns are fixed, but suddenly sewage starts overloading. Cheetah mode temporarily breaks, slowing the game to a crawl. Maybe education isn't being reported correctly. Maybe entire cities are becoming unusable. Just look at the Update 9.0 issues forum post on the official website to witness the endless parade of stupid little things that have been getting fixed and unfixed for months. The simulation aspect of SimCity is in a constant state of flux, thanks to those annoying little issues. While the number-crunchers grit their teeth, more creative players like myself sink deeper into despair. Yes, new content has been released since the game launched, giving us more objects to place and play with. What we have not gotten is more room. Cities size limits are reached far too quickly, and there isn't much room to be creative with our layouts. I want to build sprawling city-scapes that stretch for as far as the eye can see. I want to merge with my fellow players' creations, forming a majestic, co-op megalopolis, instead of simply occupying the same map, like some amped-up Facebook social game. The recently released Cities of Tomorrow expansion introduces MegaTowers, allowing players to build multi-zoned, multi-functional super structures — like having a SimTower in your SimCity — but that's a $30 fix that doesn't quite give me the freedom I yearn for. I am disappointed in SimCity, and nothing Maxis or EA has done since launch has changed that. I know there are players who somehow manage to embrace the game with all its flaws, but I am not one of them. I'd go as far as to say that my 2013 would have been a much happier one if I'd never played SimCity.